Toyota cars are transported from the automaker's UK plant in Burnaston. 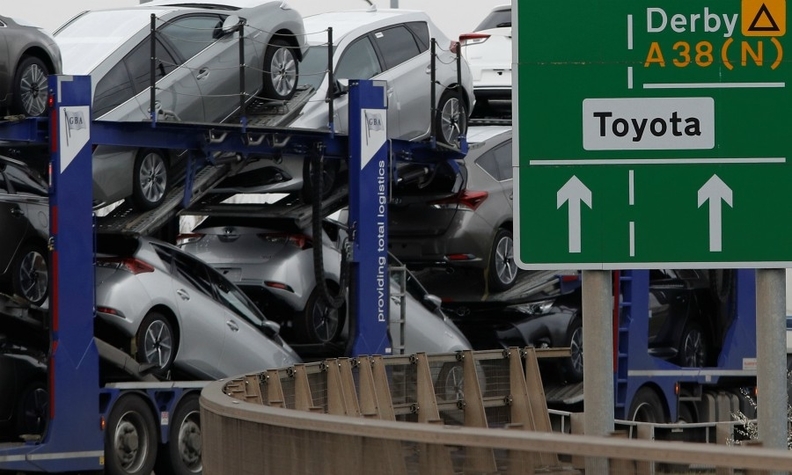 TOKYO -- British foreign minister Jeremy Hunt is seeking to reassure Toyota that the UK government is focused on avoiding a no-deal exit from the European Union and ensuring tariff-tree trade between the UK and the EU. Hunt was visiting Toyota on Monday after meeting Japanese Prime Minister Shinzo Abe. "We recognize that Japan has many investments employing hundreds of thousands of people in the UK. We want strong cooperation to continue," Hunt told Abe at the Japanese leader's residence in Tokyo. Toyota builds Corolla and Avensis models in Burnaston, England, according to Automotive News Europe’s Assembly Plant Map. The company has announced plans to build a new car for Suzuki in Burnaston. Britain's decision to leave the EU has raised concern in London that Japanese companies will shift operations elsewhere if tariff-free trade ends with the rest of the European bloc. Honda has said it will close its UK plant near Swindon by 2021 while Nissan canceled plans to build its X-Trail SUV at its factory in Sunderland, northeast England.